Our very own Guy Renaud was the guest of honour on an Haitian freethinkers’ live show, hosted on BlogTalkRadio. You can listen to him talk about growing up as a believer and how he became an atheist. Most of the conversation is in English, but props to you if you understand the English, the French, and the Haitian Creole! Moutons No More is back on stage for a third season of shows! Moutons No More is changing its game in 2016 and we’re excited to bring you the following changes. But first, the sad news: our stage show, Funny You Should Think That!, is going on hiatus indefinitely for personal reasons. Our multimedia productions, however, are not affected in the least. The podcasts and videos we put out will continue to regale you this year. While FYSTT is going away for the moment, we are not ready to step off the stage, especially since we found an amazing new location that we will surely come to call “home”. The Katacombes, on Saint-Laurent Boulevard, two steps away from the Saint-Laurent metro station on the green line, is welcoming our troop of freethinkers with a gorgeous stage, enough room for 125 people, and a column made of skulls (they’re not real). THE BODY OF EVIDENCE: LIVE ON STAGE! You listen to the podcast; you watch the videos; you read the blog. Now you can come and see us on stage! Dr. Christopher Labos, cardiologist, and I will be co-hosting a stage show version of the podcast three times a year at Katacombes. The comedy quiz show I hosted for FYSTT will return, with stand-up comedians and permanent panelist Chris Labos trying to answer my questions on health, medicine, and science. Plus short talks, Q&As, interviews, and bickering. Always. Find us on Facebook by searching for “The Body of Evidence” (if you see our faces, you haven’t landed on the Madonna movie fan page) and “like” the page. Stage shows will be created as Facebook events through this page. Go to our website at http://www.bodyofevidence.ca and enter your email address under “Subscribe”. Le podcast sceptique animé par Isabelle Stephen et Christopher Hammock fera un retour sur scène en début d’été aux Katacombes avec sa combinaison usuelle de contenu fantastique, d’invités hors-pairs et d’enthousiasme démesuré! Le seul spectacle sceptique francophone au Québec s’attaquera au paranormal, à la religion et à la pseudoscience et continuera de démontrer que le scepticisme n’est pas frustrant mais bien merveilleux! Cherchez “Le monde merveilleux du scepticisme” sur Facebook et cliquez “J’aime”! Les spectacles seront annoncés sur cette page. Visitez le site Web du podcast à http://www.lmmds.ca et écoutez l’émission pour être informé des spectacles à venir! A final word on the past two years: we extend our warmest thanks to all the people who have come to our shows. We have had a blast putting together 15 shows and seeing our audience grow, especially the friends and relatives who were invited even though they were not skeptics. We firmly believe skepticism should not be solely addressed behind closed doors but should be made accessible to all, and we will continue to apply this mantra with our newest stage shows by combining discussions, humour, education, and good, old-fashioned fun. Our Meetup page will disappear in April, since we are no longer receiving money to keep it going. We don’t want to lose you, so please find Moutons No More on Facebook or subscribe to our website at http://www.MoutonsNoMore.com to see the content that we generate. We hope to see you at the first Body of Evidence show in a couple of months and the Monde merveilleux du scepticisme show at the beginning of the summer. Thank you for supporting us and enjoying our productions. With your collaboration, we will continue to spread the word about critical thinking in the Montreal community and beyond… in both English et en français! The show that almost didn’t happen got more photographers than ever, so we present you the best of the best from that night’s pictures, courtesy of Angie Radczenko, Vincent Fréchette, and Noxi Black! If you want to help us keep the show going, help us find a new venue! The show opened with a Bollywood number… because Isabelle. Remember, people: every penny counts! Host Isabelle Stephen goes through the claims of The Law of Attraction… but is it even a law? Peter Hartman wants to help people through the Law of Attraction… but is there anything salvageable in it? Given our latest series of mishaps at our current location, we have decided to call upon you to help us find a new venue for Funny You Should Think That! As you know if you’ve been to the show, we cannot do this in any venue, since we often require many microphones, enough room for 5 people, some type of projection or display behind us, etc. The show will be going on hiatus until we find a new location, but if you love the show and want to see it continue, we urge you to send us suggestions of appropriate bars, pubs, and cabarets. 1) A venue that is accessible. A past poll reveals that the majority want a location that is in or near downtown. It has to be close to a metro station as much as possible. Decent parking is also fairly important. 2) A closed room. While we would love to grab the attention of patrons during the show, our past two experiences in open areas have proven that people who didn’t come for the show can behave like assholes and drown us out. We thus need a closed-off section that can welcome at least 50 people. 3) A large stage. Some pubs have a tiny stage made for one comedian. Since we often have panel discussions and debates (and sometimes dance numbers), we need to be able to fit 5 people side by side comfortably. 4) A weekend time slot. Since one of us works nights during the week, we can only do the show on weekends. This means a Saturday or Sunday night slot, although we could always do a late afternoon show as well, and move to another place for discussion afterwards. 5) Alcohol and food. While these are not essential, we feel that a pub-type atmosphere is more conducive to the casual nature of the show. 6) A display on stage. We often use slides or show videos and thus need either a large-screen TV near the stage or a screen with a projector. 7) A free ride. Finally, given the importance of paying our talent and how little money we collect at every show, we cannot afford to pay a 200$ rental fee on the room. We have been lucky in the past to get the room for free. We could even pay a small fee if necessary, but we cannot rent a room at full price and essentially pay the salary of the wait staff and the kitchen staff while we’re there. Funny You Should Think That! is a labour of love and a much-needed show in this city. There is so much irrationality that needs to be addressed, and the feedback has been overwhelmingly positive. If you know of a venue that fits these criteria, get in touch with us. If you want to start investigating, we would be eternally grateful. FYSTT is on hold for now but we will keep you informed. A show of comedy, reason, and alcohol. FUNNY YOU SHOULD THINK THAT! is a monthly event (intelligently) designed to make you laugh and think. Moutons No More takes to the stage with amazing guests to get you to think more critically. It’s like the Rolls Royce of Skeptics in the Pub and just what Montreal needs. Come for the show; stay for the conversation. This month, Isabelle brings you a show about attraction and happiness. If you wish really hard for something, will the universe give it to you? Are we made up of pure energy and will positive energy attract more of the same? Isabelle will speak with Peter Hartman, the organizer behind The Law of Attraction Montreal, on the topic of happiness. 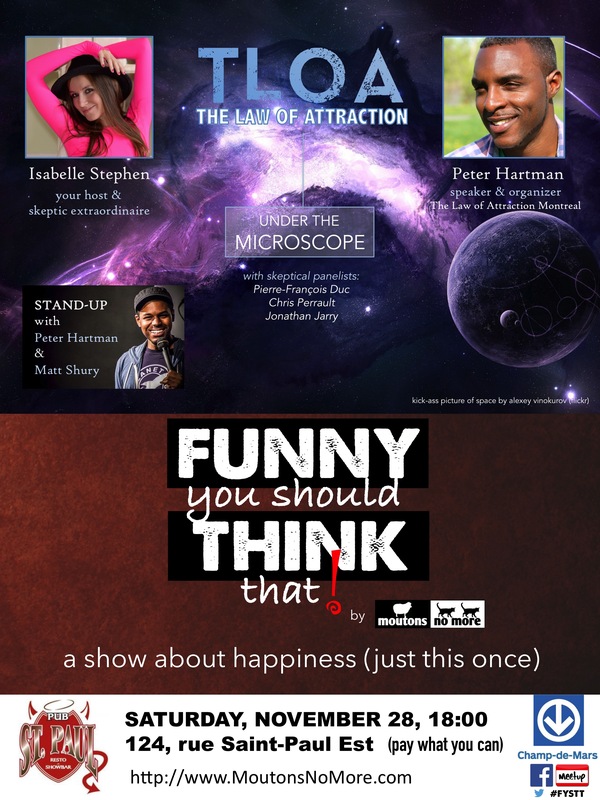 Peter and Isabelle will then be joined by a panel of skeptics to go over the claims made by the Law of Attraction: physics Ph.D. student Pierre-François Duc; Moutons No More producer and scientist Jonathan Jarry; and skeptic and jack-of-all-trades Chris Perrault. Bookending our amazing show will be a Bollywood dance number by Isabelle and stand-up comedy by Peter Hartman and Matt Shury! Dancing, comedy, and rationality, all in one unique package. It’s all happening on Saturday, November 28 at Pub St-Paul in Old Montreal! One contestant started… contesting? with her partner? Gina Granter, Guy Renaud, and Karl Knox. You’re never too old to play air guitar. Niqabs are apparently acceptable at Funny You Should Think That!